Park Avenue West, nicknamed PAW, is a high-rise building currently under construction in downtown Portland, Oregon, United States. 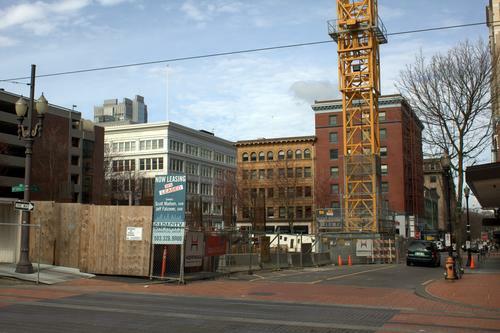 When completed it will stand at a height of 476 feet (145 meters) and become the third tallest building in Portland behind the Wells Fargo Center and the US Bancorp Tower. Park Avenue West was initially scheduled to be completed in 2010 and is being developed by Tom Moyer. The tower was to have a total of 33 floors and offer retail space, office space and 85 housing units. The housing component has since been dropped from the plans (see below). It will also have a five floor underground garage with 315 parking spaces. The roofline was to be at 476 feet (145 meters), but the building would have had two twin spires at the top, which put the building at a height of 515 feet. The twin spires were expected to be lit up at night. The building gained the top four floors when developers agreed to add 1,650 square feet of bike facilities (including public bicycle commuter showers, bike parking, and locker space) under the connected Director Park subsurface parking, gaining the tower a 40-to-1 bonus.